ALA Chicago Conference featured tons of programs, exhibits and exhibitor events. DEMCO hosted a pizza party that celebrated strong school libraries. 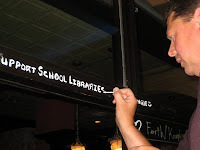 The Pizza restaurant encouraged wall-writing, so (with permission and a small bottle of white out....) check out the new sign above the door: "Support School Libraries!"